In previous articles, we generated and completed a certificate request. Keep in mind that despite the request being completed it is not yet live. We must still assign services to that certificate. In this article, we will assign services to a certificate (affiliate) in Exchange 2016. 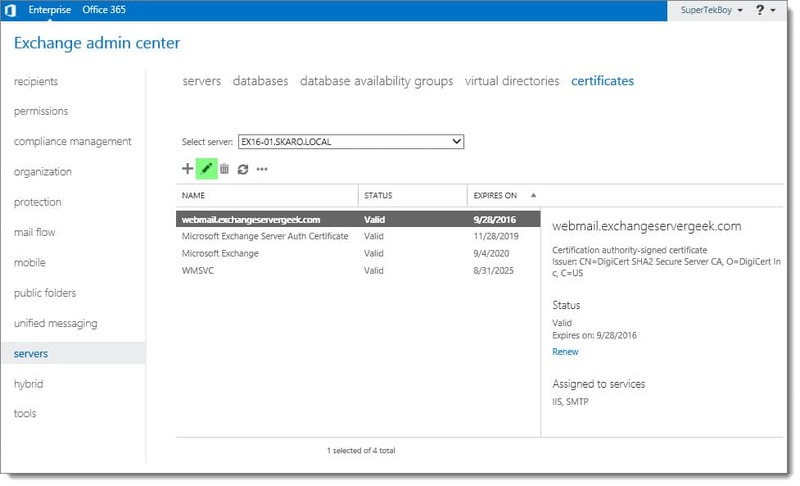 We explore how to accomplish this using Exchange Admin Center and PowerShell. Select your certificate and click the Edit ( ) button. Select the Services tab. Pick your desired services. Click Save. In our example we just picked IIS. This may take a minute or so to process. Once complete you will see the certificate has been assigned to the services you picked. In our case IIS is now assigned to the certificate. You can obtain the thumbprint by running Get-ExchangeCertificate. -Thumbprint specifies the certificate to configure via its thumbprint. 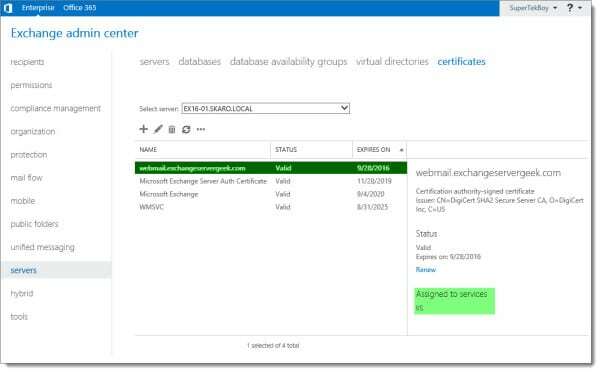 -Services define which components you want to use the certificate with (e.g. IIS, SMTP, etc.). 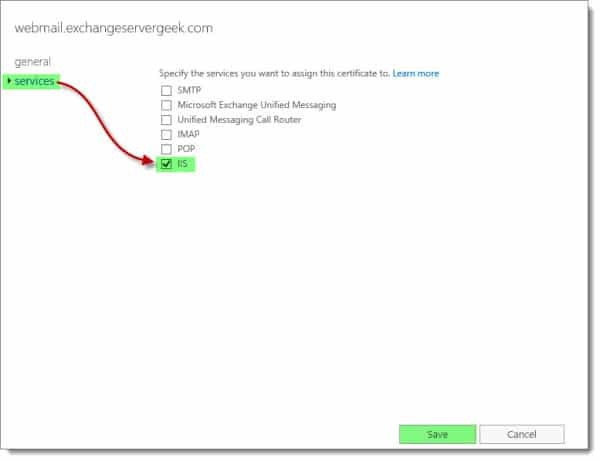 To verify the services have been assigned run the Get-ExchangeCertificate command. The services column indicates what services are currently assigned to the certificate. In the example above IIS (W) and SMTP (S) have been assigned to this certificate. Other possibilities include POP (P), IMAP (I) and Unified Messaging (U). The easiest way to check is to enter your URL into a web browser. In our case, we enter https://webmail.exchangeservergeek.com/ecp. This should result in no certificate errors. Let’s test AutoDiscover as well. In our case https://autodiscover.exchangeservergeek.com/autodiscover/autodiscover.xml. You will be prompted for credentials. Once entered you will receive the following response. Despite it being an error it is expected behavior. Autodiscover was expecting Outlook, not Internet Explorer. Tests results all good? Awesome! Your certificate is correctly installed. 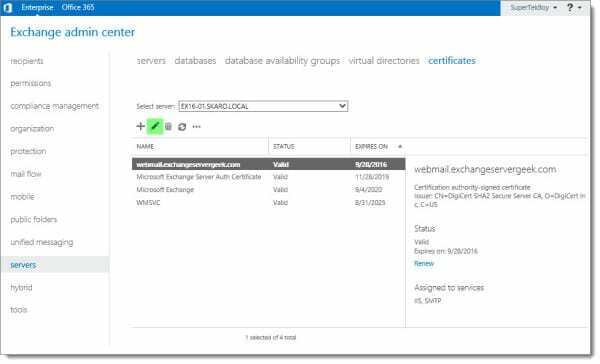 If you have multiple Exchange servers it is important that we copy this certificate to each Exchange Server. To do this check our article on importing and exporting Exchange certificates. I always like the detail of your articles. You have bits of information others don’t. Thanks.